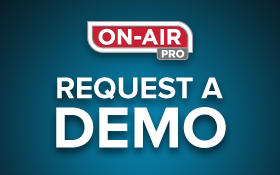 ON-AIR Pro™ will support the company’s existing promo production workflow, tracking projects from inception to delivery, and will also track Creative Services project requests. The system will integrate with the network’s internal media delivery system that feeds into WideOrbit for traffic and playout. “We are thrilled that GSN has chosen ON-AIR Pro™ as its creative workflow solution for entertainment marketing,” commented Jonathan Mickelson, Chief Technical Officer, Thought Development Corp.
“ON-AIR Pro™ will provide us with a central location to track and access real-time information of project status and details, empowering our producers, editors, and their teams to become even more agile and efficient,” commented Heather Reid, Executive Director of Production, GSN.